Demo With KUKA youBot showing dynamic motion planning with human obstacles. The algorithm has been developed in the SEAMLESS project at SINTEF ICT. Mobile robot manipulators (mobile robots with one or more attached manipulator arms) will be prevalent in addressing many future industrial and social needs such as contributing to the caring for an aging population, performing autonomous inspection, maintenance and repair operations in onshore and offshore industrial facilities, operating the factories of the future, as well as monitoring environmental pollution and removing contamination. However, in order for such robots to seamlessly navigate and operate in more complex dynamic environments, important challenges regarding real-time 3D mapping and synchronized robot arm and base navigation must be addressed. The SEAMLESS project is a SINTEF strategic initiative addressing these challenges, with particular focus on two aspects. In order for robots to navigate more seamlessly and more like humans in complex environments, reacting to dynamic events and coping with changes in the environment, there are a lot of unsolved problems. Particularly there are challenges regarding how to create a good compact environment representation, fusing data from lots of sensors, incorporating sensor uncertainties, dealing with localization problems, merging sensor data over time and dealing with and representing dynamic events and future predictions. Further complicating the matter is the requirement that all this must be performed in real-time, and work both indoor as well as outdoors in changing weather conditions. The SEAMLESS project aims to address several of the challenges and work to expand and build on SINTEF's prior experience in the field to develop new algorithms for robot environment representations, especially adapted for mobile manipulator navigation. Navigating robot manipulators are inherently complex due to the large number of degrees of freedom (DOF) in addition to uncertainties in the robotic system itself and the environment that the robot is operating in. Two separate dimensions of mobile manipulator navigation exist: motion planning and reactive motion control. Motion planning is employed in order to plan a feasible path from one position to another based on full or partly knowledge of the robot's environment. Reactive control methods are in charge of realizing the planned motion while ensuring that the robot avoids unforeseen obstacles detected from local sensor readings. In order to cope with dynamic environments in an efficient manner, traditional global path planning algorithms need to be combined with reactive strategies having much faster update rates. This enables a planning and control framework which builds on the advantageous of both approaches. 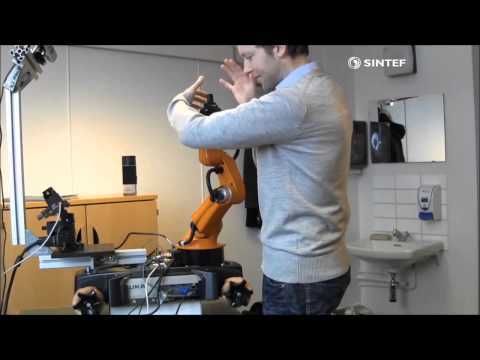 In the SEAMLESS project SINTEF is developing methodology and algorithms for mobile robot manipulator navigation while taking full advantage of the new SEAMLESS environment representation as an integrated approach.